When it comes caring for your four-legged family member, feeding him a well-balanced diet that meets his nutritional needs is the most important thing you can do. While there are many dog food options to choose from, dry dog food is, by far, the preferred choice for pet owners and their furry companions. Generally, it’s a lot easier to work with than wet dog food. You don’t have to fumble with opening and discarding a new container at every meal time. Instead, all you have to do is snip a bag of dry dog food open and pour it into a dog food container to retain its freshness; some dry dog food brands even come in resalable bags, so you don’t even have to worry about switching the container! Plus, dry dog food tends to be less smelly and neater than wet food, so if you have a sensitive nose or you don’t want to worry about cleaning up your pup’s messy mouth, then dry kibble is the way to go. In addition to being easier, less aromatic, and neater, there are also a myriad of dry food formulas. Some options include grain free dog food, organic dog food, dog food for sensitive stomachs, dog food for weight loss, and senior dog food; and those are just some of the options! But with so many choices, it can be hard to decide what the best dry dog food is for your pooch. To help you narrow down the field, we’ve extensively researched a wide range of dog food brands to compile a list of what we believe to be the top rate dog food currently on the market. Now that you’ve had a look at our picks for the best dry dog foods, let’s take a more in-depth look at each formula. Below, we provide a detailed review of each of these best dry dog food brands, including the ingredients they contain, what we like about them, and what pet owners who have fed these formulas to their dogs have had to say. After you read the reviews and decide which option is the best for your four-legged friend, click on the buttons to find the best prices on Chewy and Amazon. 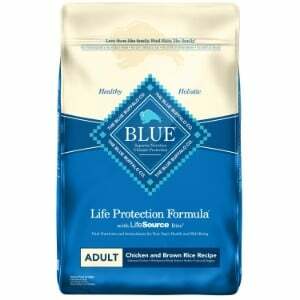 Starting out our list of the best dry dog foods is Blue Buffalo’s Life Protection Formula Natural Adult Dry Dog Food. This formula is excellent for dogs of adult dogs of all sizes, making it a great food for small dogs, as well as an excellent food for large dogs. It’s also suitable for all breeds, so whether you have a Husky, a Pug, a Dachshund, a Doberman, or a German Shepherd – or if you have a multiple dogs of different breeds and sizes – this formula will offer all of them the nutrition that they need. Like all Blue Buffalo foods, the first ingredient in their Life Protection Formula is real animal protein, which, in this formula, is derived from protein-rich deboned chicken. It also contains an assortment of fresh fruits and garden vegetables, including blueberries, cranberries, sweet potatoes, and potatoes. Whole grains are also featured in the recipe, such as brown rice, making it a nutrient rich, easy to digest dry dog food. Formulated with glucosamine, this recipe also helps to support joint health and improves mobility. The addition of Life Source Bits, an exclusive ingredient found only in Blue Buffalo dry dog food, provides the nutrition of antioxidants and other vital vitamins and minerals to further enhance your adult dog’s health. It’s also completely free of ingredients that many dogs are sensitive to, such as poultry byproducts, corn, wheat, and soy. And, since it’s completely free of artificial flavors and preservatives, you can rest assured your pooch will be eating an natural food. Final Verdict: For well-balanced, complete nutrition that is designed to support the overall health of your adult dog – no matter what breed or size – Blue Buffalo Life Protection Formula Natural Dry Dog Food is a great choice. Made with wholesome ingredients and formulated with vital antioxidants, vitamins, and nutrients, this formula will keep your pup happy and healthy. 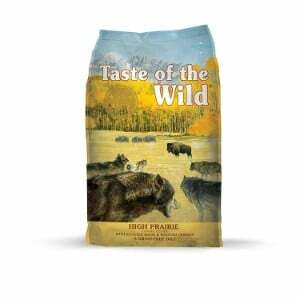 For pet owners that are looking for a high protein dog food and grain free dog food, Taste of the Wild Grain Free Protein Dry Dog Food High Prairie is a great option to choose. Protein is a vital part of a dog’s diet, as it helps to support muscle and joint health. By feeding your pooch a diet that is high in protein, you can potentially stave off joint issues, such as hip dysplasia, so this is dry kibble is an excellent choice for breeds that are prone to joint conditions, such as Saint Bernards, German Shepherds, Mastiffs, Great Danes, and Dachshunds; however, all dogs – even those who aren’t prone to these conditions – will certainly benefit from protein. The first ingredient featured in this formula is roasted bison, a lean source of protein, as well as venison, lamb, and chicken. The addition of probiotics, which improve digest health, making this a great dog food for sensitive stomachs, too! Other ingredients include natural fruits and vegetables, such as tomatoes, raspberries, and blueberries. This dry food formula is infused with omega 3 and omega 6 fatty acids, B vitamins, vitamin D, folic acid, biotin, vitamin E, iron, zinc, and a bevy of other essential vitamins and minerals. It’s also free of grains, artificial colors, flavors, and preservatives. Final Verdict: If you’re looking for a high quality grain free, high protein dog food, Taste of the Wild Grain Free High Protein Dry Dog Food High Prairie is an excellent choice. Loaded with essential vitamins and minerals, and featuring real animal protein, it will surely keep your pup satisfied and healthy. Whether you’re looking for a dog food for German Shepherds, a dog food for Golden Retrievers, a dog food for Dobermans, or a kibble for any other adult breed, Purina One Smart Blend True Instinct Natural Adult Dry Dog Food is definitely worth considering. The first ingredient is real turkey, and it also contains natural venison, giving this formula a protein content of 30 percent. As such, it helps to strengthen and support muscles, which important for certain breeds (like those mentioned above) that are prone to joint issues. In addition to being packed with protein, this formula also contains easy to digest carbohydrates and a wealth of essential vitamins and minerals to provide your adult furry friend with the nutrition that he needs to thrive. Featuring a mix of crunchy kibble and meaty morsels, this dry dog food is highly palatable. And, since it is free of byproducts, artificial flavors, colors, and preservatives, you can have peace of mind knowing that you will be feeding your pup a well-balanced meal that will meet all of his dietary needs. 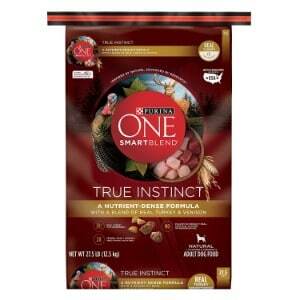 Final Verdict: If you’re looking for a high quality dry dog food for your adult pooch, Purina One Smart Blend True Instinct Natural Dry Dog Food is a great choice. It’s made with premium quality ingredients and features a wealth of nutrients to support your pet’s health. If you are on the market for a dry dog food that offers well-balanced nutrition for dogs of all ages and sizes, Rachael Ray’s Nutrish Natural Dry Dog Food is worth considering. Made by celebrity chef Rachel Ray, who is also an animal advocate, this food is specifically formulated to meet the dietary needs of all canines. The first ingredient used in this dry dog food formula is real chicken that was raised on US farms. This high quality source of protein helps to build and support lean muscle mass, while promoting health organs, too. Whole grains, such as brown rice, and a variety of vegetables, including peas, carrots, and beets, are also used in this kibble. To ensure that this dry dog food offers optimal nutrition, it’s formulated with a bevy of nutrients, including vitamin B12, vitamin K, thiamine, folic acid, vitamin D3, potassium, vitamin A, niacin, and vitamin C, just to name a few. However, do be advised that it does contain corn and soybeans, so if your pup has food sensitivities, you might want to consider another dry food formula. 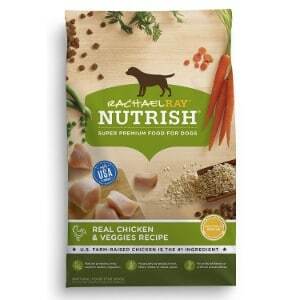 Final Verdict: Rachael Ray Nutrish Natural Dry Dog Food is a well-balanced meal for dogs of all ages, sizes and breeds. The ingredients used in this formula help to support optimal health, and most people say that their dogs do love the taste. Last, but definitely not least, of the best dry dog food options is the adult dog dry food from Diamond Naturals. 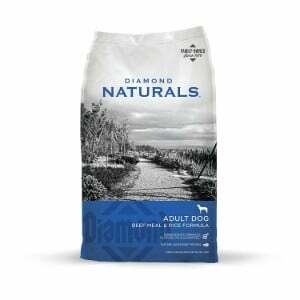 The manufacturer, Diamond Naturals, is highly regarded for creating perfectly balanced, complete, holistic nutrition for pets. This food contains premium quality ingredients for optimal health and incredible flavor that your dog will love. Made with pasture raised beef, which contains essential amino acids, this dry food formula helps to support lean, strong muscles. The inclusion of superfoods, such as chia seeds, kale, blueberries, and pumpkin, offer pups’ the key nutrients that they need to thrive, including vitamins, minerals, antioxidants, and fatty acids. Enhanced with K9 Strain Probiotics, this kibble will help to promote a healthy immune and digestive system. It also contains excellent sources of antioxidants, such as oranges, blueberries, spinach, and carrots. This formula is completely free of artificial colors, flavors, and preservatives, as well as corn, wheat, and other fillers, and it meets the most stringent food safety standards. Final Verdict: Diamond Naturals Dry Dog Food for Adult Dog is made with premium quality ingredients and totally free of fillers and other additives that can cause adverse effects, so you can rest assured your pooch will receive optimal nutrition. Most reviewers reported excellent results, and our panel of experts were very pleased by the product. As a pet parent, you want to feed your dog the best possible food; however, that’s easier said than done. There are so many different types of dog food on the market, and unfortunately, not all options are created equal. With that said, if you’ve decided that dry dog food is what you would like to offer your dog, you’ve already narrowed down the field a bit. But, there is a seemingly endless array of dry dog food formulas made by so many different manufacturers. So, how do you know what dry dog food is the absolute best? In this section of our review, we’ll highlight some important factors to consider when selecting a dry dog food. We’ll also let you know how we concluded the top dry dog foods that are featured in this review. After reading this buyer’s guide, you should be armed with enough information to help you make the most educated choice for your canine companion so you can provide him with the optimal nutrition that he needs and deserves. As mentioned (and as you have probably already seen yourself), there are so many different dry dog food options available. But not every option offers quality nutrition. While sure, any food will fill your pet’s belly, some dry kibble formulas do little more; and they don’t even fill your pup’s belly for long! Premium quality ingredients. Top rate dry dog foods are made with the highest quality ingredients. This includes natural protein that is sourced from real meat, natural fruits and vegetables, and healthy supplements to enhance the nutritional value. Natural sources of protein can include beef, turkey, lamb, venison, chicken, and fish. Real fruits and vegetables might include carrots, sweet potatoes, spinach, and beets. Supplements, such as glucosamine, amino acids, antioxidants, and various other essential vitamins and minerals, are also important. Avoid artificial ingredients. Try to steer clear of dry dog foods that contain artificial ingredients, such as preservatives, colors, and flavors. These ingredients can wreck havoc on your dog’s health and cause serious adverse effects. For the best possible nutrition, you want to stick with the most natural ingredients, and artificial anything is a sign of a poor quality food. Steer clear of byproducts. A lot of dry dog food formulas contain byproducts, such as hooves, horns, and even the hair of animals, and they are used as fillers. These fillers are meant to help hold the shape of the food, and offer little to no nutritional value. In fact, fillers can actually be harmful to your pet; so, make sure you avoid foods that contain them. Check reviews and recalls. Unfortunately, a lot of pet foods are recalled because they contain ingredients that are harmful for pups, or they feature things that weren’t meant to be mixed into the formula. In either case, check to see if the dry food you are considering for your pup has been recalled. If it has, find out why and what was done to correct the issue. Also, if the issue was corrected, see if you can learn what type of precautions the manufacturer has taken to avoid problems in the future. Also, reading dry dog food reviews that other pet owners have provided can help to shed a lot of light on a product. For instance, while a food may contain high quality ingredients and be safe for consumption, that doesn’t mean your pet is going to like it. Reviews can give you more information about a product and help you decide if it’s the best choice for your pet. So, how did we select the best dry dog food options that are featured in our review? We assembled a panel of experts, including veterinarians and animal nutritionists. This panel assessed countless dry food formulas from several manufacturers. They checked into the ingredients, discovered the nutritional profiles, and learned about the manufacturing processes that are used to create each product. We also read through dozens of dry dog food reviews to find out what pet owners had to say. Based on the reviews that we read and the information that our panel of experts shared, we were able to narrow down the options to the five dry dog food formulas featured in our review. We can say, with confidence, that each of these products contain premium quality ingredients, are safely made, and offer complete nutrition for your pet. If you want your four-legged family member to live a long, happy, and healthy life, then you are going to have to feed him food that is made of the highest quality ingredients and meets his nutritional needs. Each of the dry food formulas listed in our review are made with superior ingredients and offer nutritional profiles that will ensure your pooch receives all of the vitamins and minerals he needs to thrive. If you do decide to purchase another type of dry dog food, make sure you do your due diligence and thoroughly assess the product before you purchase it to ensure that it will meet your pet’s dietary needs.